Are you growing tired of coping with the constant barrage of disastrous events and happenings, both natural and human generated? Probably so. According to psychological experts, the ongoing saturation of negative news and views is producing a range of unhealthy mind-body responses—fear, anger, denial, helplessness, lethargy, despair—all symptoms that lead to mind-body fatigue. For the deeply committed activists fighting on the front lines of worthy causes, activism fatigue is a regular companion. How prominent progressive activists continue the good fight, all the while coping with a series of ongoing challenges, is admirable. One climate change activist worthy of special recognition and deep appreciation is Katharine Hayhoe, director of the Climate Science Center at Texas Tech University. As an eminently qualified atmospheric scientist—and evangelical Christian—she is very effective in communicating the realities of climate-change to the general public, even to deniers. Hayhoe’s latest video—Global Weirding with Katharine Hayhoe—offers a splendid overview of climate change for anyone seeking scientific knowledge that’s presented in a simple, clear format. Please view this 6-minute video and share it with others, especially deniers. Let’s hope Katherine can continue managing the frenetic pace of activism she’s pursuing. 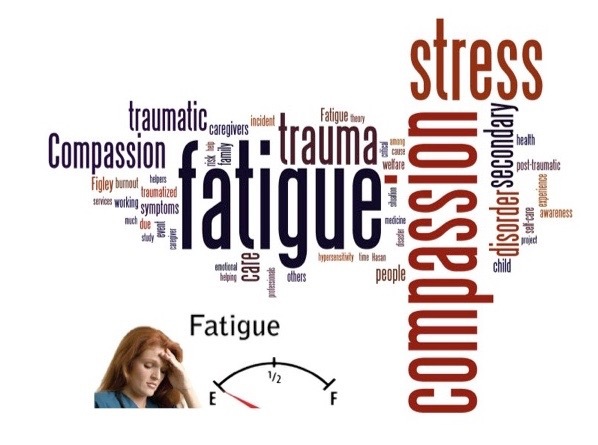 Activism fatigue may also be associated with compassion fatigue, a state where one becomes habituated or hardened to the pain and suffering of others. Medical personnel are especially prone to this type of fatigue, particularly when treating numerous disaster victims in triage. The first two articles in the Solutions section addresses the problem of activism fatigue, with some solutions offered, including the pursuit of enjoyable activities. Self-care includes making time for periodic breaks from stressful situations, an essential strategy in gaining relief from fatigue or burnout. Do not burn yourselves out. Be as I am—a reluctant enthusiast, a part-time crusader, and half-hearted fanatic. Save the other half of yourselves and your lives for pleasure and adventure. It is not enough to fight for the land; it is even more important to enjoy it. While you can, and while it’s still here. > Common Dreams: The Rich Get Richer Still (Tim Koechlin). The Trump tax proposal is appalling (if utterly unsurprising). It is immoral and it is bad economic policy. It will make the rich richer, and it will not promote economic growth. This tax plan is, in its essence, a further redistribution of income from the middle class and the poor to the very rich. It’s plunder, plain and simple. > Peak Prosperity: Too Good For Too Long (Adam Taggart). Recent abrupt before-and-after transitions of recent disasters provide a renewed appreciation for the maxim that change happens quickly. We humans tend to think linearly and comparatively, usually assuming the near future will look a lot like the recent past. Much of the time it does, but some times it doesn’t, and that’s where the danger lies. Similarly, the stock market’s huge bubble seems to be headed for a big correction. Three survival takeaways: 1) Preparation only matters when done in advance; 2) People matter more than property; and 3) Community is priceless. > Resilience: Team Human Podcast: There’s No App For That (Douglas Rushkoff, Richard Heinberg). The idea that technological “progress” is a panacea for solving systems-level crises like climate change is challenged. Richard looks at the fundamental ethical problems underlying climate issues such as overshoot, unsustainable growth, and inequality, and challenges us to acknowledge the deliberate moral intervention that is urgently needed if we are to foster a more resilient and more just community and ecosystem. > Common Dreams: The Establishment Still Doesn’t Recognize The Political Revolution That’s Happening (Jeff Weaver). Recent polling now shows escalating support for a Medicare for all health care system. Raising the minimum wage to $15 an hour is now the position of the Democratic Party. And tuition-free college is advancing in a number of states. All impossible! All happening. The Political Revolution’s path to real progressive change is becoming clearer. Sadly, most in the establishment still don’t get it. > Resilience: Re-Imagining Politics Through The Lens Of The Commons (David Bollier). The commons paradigm, a self-organized social systems for managing shared wealth, offers a refreshing and practical lens for re-imagining politics, governance and law. As a system for mutualizing responsibilities and benefits, it is highly generative, as seen in the successful self-management of forests, farmland, and water, in open-source software communities, open-access scholarly journals, and “cosmo-local” design and manufacturing systems. > Resilience: Transition Sacred (Erik Lindberg). I am still hoping for a sort of drastic cultural change, a new way of seeing and believing, a new paradigm, a reorientation of wants and expectations, dreams and desires—and all the more so for abandoning some of the pragmatic and logistical aspirations that initially led the way in many a Transition imagination. In other words, what if we now focus mainly on all the inner change that has happened along the road to Totnes [an English Transition Town]? > Feasta: The Future Of Renewable Energy (Brian Davey). Trying to build an electrical energy system mainly with wind and solar that would be able to meet the demand for electricity at all times as we have now is a futile endeavor. It would be way too expensive in money, resources and energy. We must get used to the idea of using electricity only when the sun is shining and the wind is blowing (enough). > The Hill: EPA’s 4-Year Strategic Plan Does Not Mention ‘Climate Change:’ Report (Avery Anapol). The 38-page document, released for public comment last week, does not include the phrases “climate change,” “carbon dioxide” or “greenhouse gas emissions. This is in stark contrast to President Obama’s 80-page plan, which listed “Addressing Climate Change and Improving Air Quality” as one of its central goals, and referenced climate change more than 40 times. >MPR News-AP: Poll: Americans Blame Wild Weather On Global Warming (Win McNamee). A new poll (Associated Press-NORC Center for Public Affairs Research) finds that 68 percent of Americans think weather disasters seem to be worsening, 28 percent think they are staying the same, and 4 percent say they are less severe. And 46 percent of those who think it’s getting worse blame man-made climate change mostly or solely for the wild weather, while another 39 percent say it’s a combination of global warming and natural variability. > National Geographic: Hidden Costs Of Climate Change Running Hundreds Of Billions A Year (Stephen Leahy). Extreme weather, along with the health impacts of burning fossil fuels, has cost the U.S. economy at least $240 billion a year over the past ten years. And this does not include this past month’s major hurricanes or over 76 wildfires in nine Western states. Those economic losses alone are estimated to top $300 billion. The next decade it may well cost $360 billion per year. > USA Today: Yellowstone Supervolcano May Blow Sooner Than Thought—And Could Wipe Out Life On The Planet (Matthew Diebel). The previous eruption occurred around 1.3 million years ago, indicating that the system might be ready for another explosion. Researchers have determined that the super volcano has the ability to spew more than 1,000 cubic kilometers of rock and ash—2,500 times more material than erupted from Mount St. Helens in 1980—an event that could blanket most of the United States in ash and possibly plunge the Earth into a volcanic winter. > Futurism: The Reports Are In: AI And Robots Will Significantly Threaten Jobs In 5 Years (Kyree Leary). IT leaders believe automation could impact 60% of businesses by 2022 and threaten jobs in the process. A separate report suggests a similar timeline; one in which people may need to practice and learn new skills. A startling scenario the report envisions is a future in which “typical” jobs no longer exist, Former Vice President Joe Biden believes that making jobs and hard work a priority is better for everyone. > Resilience: After The Disaster Comes Disaster Fatigue. Here’s How To Fight It (Eve Andrews). In the face of so many crises in a row, we’re all suffering from “disaster fatigue”, when prolonged exposure to news coverage of disasters causes potential donors or volunteers to lose motivation. We humans are wired to protect ourselves against an unlimited amount of trauma, which produces compassion fatigue and even resistance fatigue. Solution: take regular breaks to enjoy pleasurable, restorative activities. > The Washington Post: There’s Enough Wind Energy Over The Oceans To Power Human Civilization, Scientists Say (Chris Mooney). New research finds that wind energy potential over oceans could theoretically be used to generate “civilization scale power”—assuming the willingness to cover enormous stretches of the sea with turbines, plus install and maintain them, often in extreme ocean environments. These are purely theoretical calculations are thwarted by many practical factors. > Shareable: Want To Change The System? ‘Become The System’ (Bart Grugeon). We live in turbulent times: many certainties are disappearing and changes are difficult to understand. Can transition management help us to explain where the world is heading? Derk Loorbach, director of the Dutch Research Institute for Transitions (DRIFT) at the Erasmus University of Rotterdam, talks about the mechanisms, risks, and trends necessitated by transitioning towards a more sustainable world. > Resource Insights: The Italian Experiment And The Truth About Government Debt (Kurt Cobb). The Italian government recently announced that they will try paying for government services with tax credits—essentially reducing a person’s tax bill in exchange for services rendered or products delivered. This concept challenges our ideas about the nature of government debt and taxation. Read why a sovereign currency makes this possible and even desirable. > Yes! Magazine: This Isn’t Just Another Urban Farm—It’s A Food Bank (Sammi-Jo Lee). Partnerships between food banks and local agriculture are on the rise. Food banks are farming produce, recovering (or “gleaning”) agricultural surplus straight from the fields, building urban demonstration gardens and seed libraries, and teaching classes in underserved neighborhoods for those who want to grow food in their backyards or in balcony bucket gardens. > Post Carbon Institute: Introduction To The Community Resilience Reader (David Lerch). The failure of international sustainability efforts to thwart converging crises means resilience-building efforts at the community level—working on all issues and systems, not just climate change and infrastructure—are needed more than ever. Building community resilience starts with the courage to collaborate with the people around you to protect the things about your community that you value most.